Anyone with a laptop knows it cannot be simply lugged around. Furthermore, any woman knows laptop cases can be bulky–and ugly. Following are the top-10 laptop totes for women. Like any laptop case, they protect your computer from bumps, scratches, and impacts. They are durable and come in a wide range of sizes, styles, and materials. Most important, these totes are popular with women everywhere. They represent the top 10 best laptop totes that averaged 4.5 out of 5 stars from reviewers. 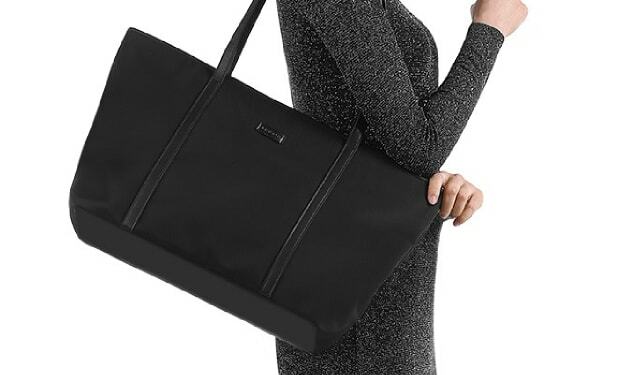 This bag offers women a fashionable, versatile laptop tote fit for work, school, or the home. In fact, because it is made of a premium canvas, you can take it anywhere, including outdoor events. 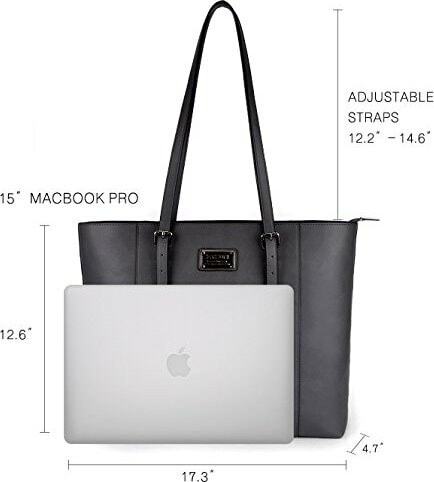 This laptop tote is compatible with Ultrabook, Chromebook, MacBook, and Notebook computers up to 17.3 inches. Additionally, it also has room for all the stuff you may need throughout your day. There are separate compartments for your laptop and daily items, and it also has exterior pockets for such things as keys and your cell phone. Finally, a one-year warranty is available on all bags. Some people look for more pockets. However, for most women, this tote has enough to fit all their storage needs. ZMSnow offers women a laptop tote made from the highest quality PU leather. It incorporates hardy stitching and metal hardware. It is also water resistant. 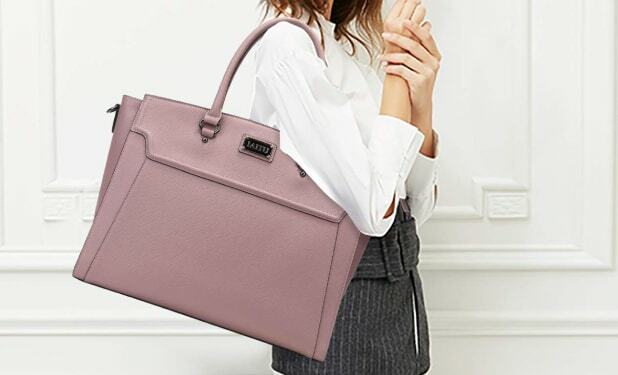 This laptop tote’s elegant design ensures it will never go out of style. There are multiple pockets to help you keep your belongings organized. PU leather is synthetic and not as durable as genuine leather. However, this tote is made from the highest quality PU leather and designed to be durable for business travel and everyday use. This beautifully designed laptop bag is available in multiple colors, has the option of shoulder or handbag style, and provides three compartments to store your laptop, iPad, and other essential items. It also has three smaller pockets for personal items. The Iaitu laptop tote incorporates a specially designed Velcro strap to keep your laptop safe and secure. It holds any laptop up to 15.6 inches. For additional security, it offers an extra compartment with thick padding. There is no exterior pocket for quick access to keys or phone. This very stylish laptop bag comes in a variety of colors and is made of beautiful PU leather. It incorporates understated hardware, making it a great choice for a professional environment. This tote has professional-grade foam padding that will protect your laptop or notebook from impacts, scratches, and bumps. The twin handles allow for shoulder or handbag use while the incorporation of zippers keeps your items safe, allowing for quick, no-hassle access. Additionally, Zysun offers every customer a money-back guarantee. Although this tote holds a 15.6-inch laptop, the interior does not seem as roomy as other totes. The UtoteBag is a sturdy and durable tote made of PU leather, available in a variety of colors. This tote includes zippers for the main compartment, and it also has exterior pockets for easy access of keys, coin purse, or phone. At approximately 0.85 pounds, this shoulder bag is lightweight–something all women can appreciate. Multiple compartments allow you to keep your daily items organized, and it is large enough to store your laptop and iPad–safely. A few additional pockets include a two-pen slot and half pockets for smaller items. The interior padding is not removable. 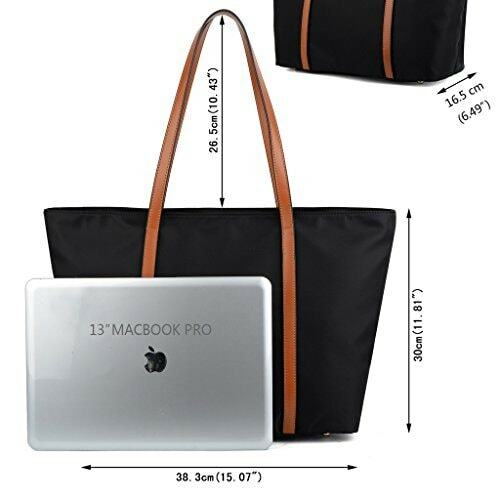 Before purchasing, ensure your computer will fit this 15.6 laptop tote bag. This beautiful tote has golden zippers and a pretty burgundy lining. The four pockets allow for carrying a variety of items. 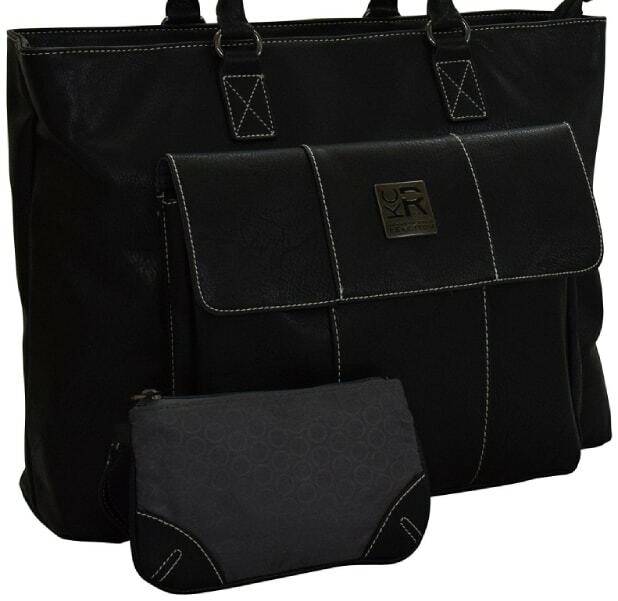 Additionally, enough pockets make this perfect for work, sports, travel, or school. Chiceco offers women three different size totes to choose from, ensuring a perfect tote for any size laptop. The extra-large size is true to its description; it is large. Make sure to use the size chart to ensure you choose the correct size to meet your needs. This beautifully pebbled PU leather laptop tote includes an exterior pocket with a flap-over design, utilizing magnets to secure it when closed. It comes in three distinct colors with a tear-resistant interior. Kenneth Cole generously includes a zip pouch for your accessories. This bag provides a lot of room along with pockets for organization. However, if you are looking for just a bare-bones laptop tote, this may be more than you need. This tote’s classic look clearly works in business and casual environments. The specially designed compartments provide superior protection for laptops up to 15.6 inches. The vegan leather exterior is truly a winner. The soft, pebbled look and nylon interior will please travelers, academics, and professionals. Some customers have reported shorter women feeling as if the bag is too big for their body height. When it comes to looks and options, this dual-tone laptop tote is a winner. In addition to the many available color choices, this tote comes with a matching wallet and a sturdy, flat bottom. The bottom is reinforced with studs to ensure stability. 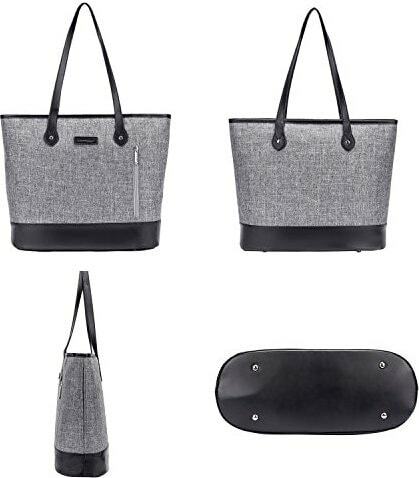 This tote stands out among laptop totes because it is made from vegan, Saffiano PU leather. No animals were harmed to make this tote. Additionally, Dasein offers it in a huge variety of colors and patterns. Some customers have reported they would have like the handbag handles to have been a bit roomier. Yaluxe has designed a laptop tote made of Oxford Nylon. The strong stitch joints and wider-than-usual straps create a comfortable tote that will last for years. It is both pliable and lightweight, suitable for a business traveler. Not only is this tote durable and waterproof, but it is also large enough for your laptop and a variety of other items. Additionally, the accompanying wristlet handbag is detachable. This bag is designed for individuals with a lot to carry. If you only have a laptop and a few items, you may want to consider a different laptop tote more suitable to your needs. This entry was posted in Laptop Bags.